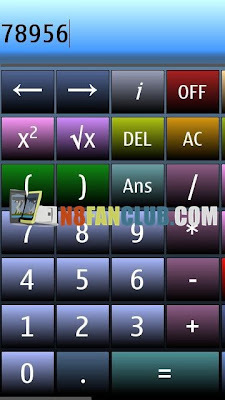 Powerful calculator where all needed features are accessible with just one flick. Works in portrait and in landscape mode. Supports long complex equations using scrollable display. Supports sin,cos,tan and their inverses in rad, deg, grad modes. It also supports sinh,cosh,tanh and their inverses. Also supports powers, roots, logarithms. All equations are shown in history list from where you can load values/expressions. Look is changeable.